The 30th Annual YMCA Auction, “Cheers to 30 Years”, took place on Friday, November 9th at the Pillars Event Center in Taylorville. The Christian County YMCA is also proud to announce Duane and Cindy Stock as Chairpersons of the 2018 YMCA Auction. Duane and Cindy have been active YMCA members since the original facility opened in 1981! Early on, Duane was involved in the youth sports programs, volunteer coaching on his son’s sports leagues and is currently serving as the President of the Board of Directors. Cindy has been a dedicated and devoted group exercise class participant since she retired 7 years ago. Duane also relied heavily on the Y facilities for physical therapy when rehabilitating from a serious accident. “The Y is an integral part of the education, medical and recreation triangle people often consider when deciding where they want to live and raise their families. Christian County is blessed to have this organization and wonderful facility that serves so many”, said Duane. The Stock’s are honored to serve as this year’s chairpersons and encourage everyone to come out for an enjoyable evening in support of this organization that’s so important to our community. Everyone is invited and welcome to attend the YMCA Auction! Reservations for this important event are encouraged by October 31st with seating available for up to eight individuals per table. Admission is $75 per person, with formal attire recommended. The evening begins at 5:30 p.m. with silent auctions opening and an array of complimentary hors d’oeuvres, champagne and beverages. A catered dinner is served at 7:00 p.m., followed by a welcome from the Auction Chairpersons and live auction led by Lance Walker of Memphis, Tennessee. An open bar and refreshments are available throughout the evening. Sponsorship and gift donation opportunities are available for both businesses and individuals. 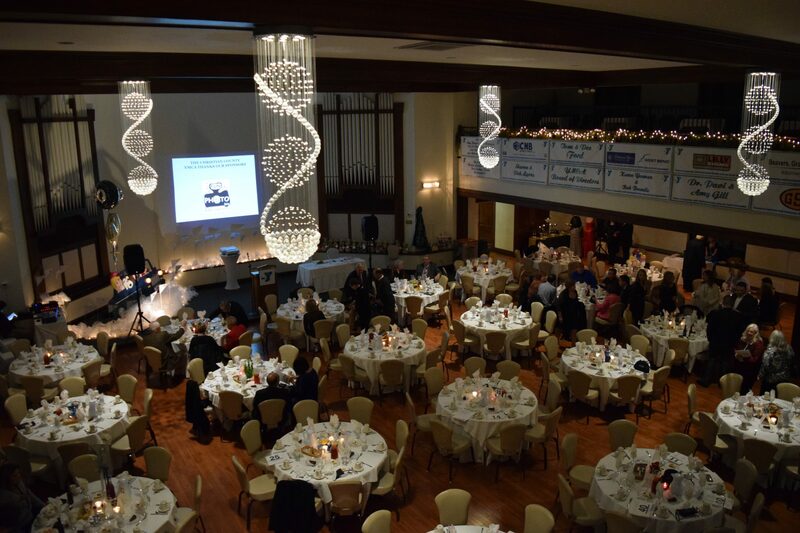 The Christian County YMCA Auction is a fundraising event with proceeds going to offset operating expenses, subsidize pricing of membership and program fees, and provide financial assistance for those who qualify. In 2017, the YMCA provided $101, 107 in direct assistance to 608 children and families in Christian County. For more information about the event, please contact the YMCA at 217-287-7271. Duane & Cindy Stock; Chairperson’s of the 2018 Annual YMCA Auction. The 29th Annual YMCA Auction, “Once Upon a Time…” was Friday, November 10th, 2017 at the Pillars Event Center in Taylorville. For the third year, the planning committee is excited to offer FREE child care with a meal at the YMCA exclusively for auction attendees. The Christian County YMCA is also proud to announce Jason & Val Lilly and Jeff & Mindy Robinson as Co-Chairpersons of the 2017 YMCA Auction. The Robinson family has been active members, program participants, and supporters of the YMCA for several years. Having three children of varying ages; they’re active in youth sports, fitness classes, aquatic programs and are frequent users of both the Wellness Center and Family Aquatic Center. While growing up, the Y was a second home for Jeff with his father, Jon, serving as the organizations Executive Director from 1983 – 2005. “We are proud and honored to provide leadership to the Y Auction and to support a great community asset that benefits people of all ages”, said Jeff Robinson. The Robinson’s hope you will join them in attending the 29th Annual YMCA Auction on November 10th or consider supporting the event through a sponsorship or donation. The Lilly family has been a proud supporter of the Y for almost 20 years at their business, Lilly Signs, LLC. Every year they partner with the Y to make projects affordable, many times donating the service or product completely. They are now starting their family and their 4 year old daughter will soon be able to play in the Y sports leagues, just as Jason did growing up. Val has also benefited, in the past, from the local Y by using the pool for physical therapy. She was in need of water rehab and did not have to travel out of town to do so. “We’re proud to support a Christian organization that our young family will benefit from for many years to come”, said Val Lilly. Admission is $75 per person and formal attire is recommended. There will be child care will be available at the YMCA from 5:00 p.m. – 10:30 p.m. for children 6 months and older. A meal and snacks will be served and swimming will also be available. The evening begins at 5:30 p.m. with silent auctions opening and an array of complimentary hor d’oeuvres, champagne and beverages. A catered dinner is served at 7:00 p.m., followed by a welcome from the Auction Chairpersons and live auction led by Lance Walker of Memphis, Tennessee. An open bar and refreshments are available throughout the evening. Sponsorship and gift donation opportunities are available for both businesses and individuals.